Recommended for: Those who enjoy religious based stories full of trials, tribulations and redemption. Yona Stern has traveled from New York to Israel to make amends with her estranged sister, a stoic ideologue and mother of five who has dedicated herself to the radical West Bank settlement cause. Yona’s personal life resembles nothing of her sister’s, but it isn’t politics that drove the two apart. Now a respected Jerusalem Talmud teacher, Mark Greenglass was once a drug dealer saved by an eleventh-hour turn to Orthodox Judaism. But for reasons he can’t understand, he’s lost his once fervent religious passion. Is he through with God? Is God through with him? Enter Aaron Blinder, a year-abroad dropout with a history of failure whose famous father endlessly—some say obsessively—mines the Holocaust for his best-selling, melodramatic novels. Desperate for approval, Aaron finds a home on the violent fringe of Israeli society, with unforeseen and devastating consequences. 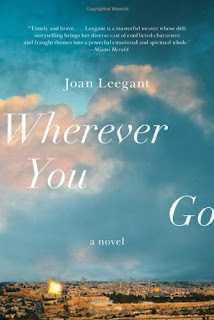 In a sweeping, beautifully written story, Joan Leegant, winner of the PEN New England Book Award and the Edward Lewis Wallant Award, and a finalist for the National Jewish Book Award, weaves together three lives caught in the grip of a volatile and demanding faith. Emotionally wrenching and unmistakably timely, Wherever You Go shines a light on one of the most disturbing elements in Israeli society: Jewish extremist groups and their threat to the modern, democratic state. This is a stunningly prescient novel. I feel I need to begin this review by mentioning the fact that Wherever You Go is not a light read. Not in the least. I was mistakenly under the impression that this relatively short read would be something light and introspective. While the book definitely raises some amazing discussion points and questions, it is by no means an easy read. It took me a lot longer to read this than anything else I've read this month. Mainly because I'd find something I wanted to mull over and have to stop reading. That being said, I also need to state that my review is entirely based on my current state of mind. This book was something that I enjoyed reading, but I didn't fall completely in love with it. Mainly because my mindset right now is just not ready to deal with such deep reading. Yona, Mark and Aaron are all at a point in their lives where they are looking for something more. After floating, trying to figure out where they belong, they end up back at their roots looking for answers. These three lives are different, but similar enough to tie together beautifully. The questions of faith and commitment are deeply ingrained in this book, along with both personal and external reflections. Although this book revolves around Jewish faith, there is a lot here that expands beyond that other religions. It is definitely a reflective read that will cause you to mull over the bigger picture. What really hampered my enjoyment of this book though was the pivotal event that ties all of these people together. I won't spoil it, but it really felt rather convenient and forced to me. After that I felt like the characters were just rushed into the ending. All the growing, learning and introspection that they had accomplished just seemed to fade, as the ending loomed. It's not that I didn't understand why the book had this turn, I did. I just felt like the first half of the book was so much more fascinating and deep than the second half. Unlike anything else I've read lately, this story was laden with insights about Israeli and American culture, as well as humanity as a whole. These characters are deep and well portrayed, but their lives seemed to never come to a nice closure for me. 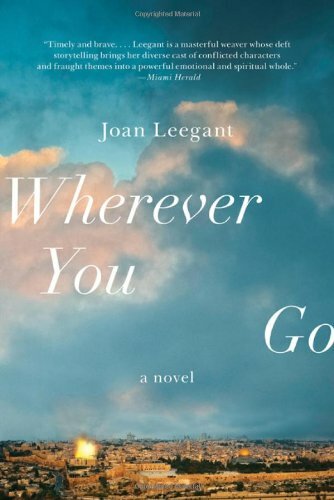 Overall I enjoyed Wherever You Go enough to finish it and keep thinking about it even after. I quite honestly would have loved it even more if the climax hadn't been so rushed.